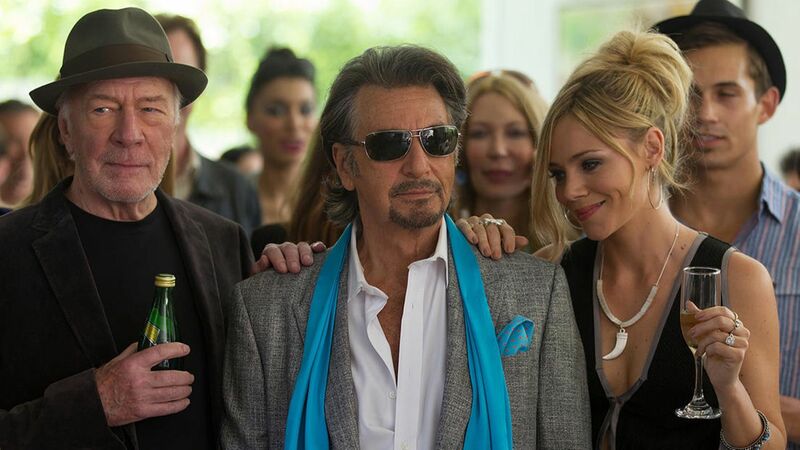 A dramatic comedy with some music, Danny Collins is about better-late-than-never priority adjustments. The film succeeds by staying within itself despite falling into some melodramatic traps. Danny Collins (Al Pacino) is a singer in the twilight of his career, milking his hit songs from decades past in front of an antiquated audience. He is frequently high on coke, and superficially enjoys the trappings of fame including a huge mansion and trophy girlfriend Sophie (Katarina Čas). When his long-time manager and friend Frank (Christopher Plummer) unearths a letter to Danny written by John Lennon in the early 1970s but never delivered, the performer is shaken out of his stupor. Recognizing he may have wasted away a career, Danny abandons his latest tour, ditches Sophie, cleans up, and relocates to a modest Hilton in New Jersey to reach out to his long estranged son Tom (Bobby Cannavale). He finds Tom, his wife Samantha (Jennifer Garner) and daughter Hope living a modest middle class life. Danny also meets and try to woo the hotel's resistant manager Mary (Annette Bening). Although at first Tom wants nothing to do with his father, Hope's ADHD and a family sickness provide the now persistent Danny an opportunity to reset some relationships. Written and directed by Dan Fogelman, Danny Collins is a low-key characters study brought to life by an irrepressible Al Pacino performance. Despite his late career crisis, Collins is written to stay true to his rascal tendencies, allowing Pacino to ride the wave of a consummate entertainer intent on making some changes but never straying far from who he is. Even as he sets up in a nondescript New Jersey suburb, Danny enjoys his fame and fortune, is not hesitant to flaunt his wealth and influence, and is happy to dole out advice and pursue Mary with minimal subtlety. The scenes with Danny getting to know Tom and his family benefit most from this focus on realistic human behaviour, with both father, son and daughter-in-law reacting with laudable maturity within the field of awkwardness. Danny is too old to worry about his own feelings, so he just niggles his way through the initial barriers to find the openings where he can make some amends to a life of neglect. Tom and Samantha are pragmatic enough to appreciate effort and good fortune when it smiles on them. The film's weaknesses reside with the eye rolling introduction of a serious disease, layered on top of young Hope's ADHD. It almost makes Danny's restitution mission too easy, fast forwarding the familial bonding opportunities to tidily fit into the under two hours of running time. Danny's romantic pursuit of Mary fares better, her wariness of the celebrity at her modest hotel providing a sturdy defence against his frontal advances. Danny Collins may lack boldness and any sort of cutting edge, but it's a well-rounded effort delivered with a veteran's sure touch.